Congrats are in order for Beyonce, and this time around, they are coming from someone who definitely knows what's up! Mariah Carey, who is a mom of twins Monroe and Moroccan, commented on Beyonce's EPIC Instagram post announcing that she was expecting twins. The diva commented on the post, saying, “Congrats Bey and Jay!!! I’m so happy for you both. Having twins is the most incredible experience ever! Love, Mariah and the twins!” Awww! So sweet, and we are so happy for Beyonce to get to experience the joy of having twins just like Mariah did! Speculation is that Mariah might have actually previously known about Beyonce's pregnancy. Back at Christmastime, Beyonce and Blue Ivy attended Mariah's Christmas concert in New York City and even posed backstage with Mariah and the twins. We know now that Beyonce was definitely pregnant at that time, and sources say that the two ladies might have exchanged twin pregnancy stories! 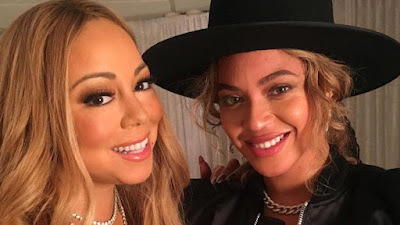 Mariah, who has five and a half year old twins with ex husband Nick Cannon, has previously said that she is a huge Beyonce fan, that she would love to spend more time together, and that she would even love to do a collaboration with Queen Bey in the future. We are so excited to see what these two divas come up with!